The system is familiar with common every day terms and phrases. Its artificial intelligence understands idioms, slang, and SMS shorthand. The application is sympathetic to grammar, syntax, and misspellings. Allen County believes that mJuror is the country’s first interactive mobile messaging application that utilizes “Natural Language Processing” (NLP) through guidance by the National Center for State Courts and research by Judicial Systems, Inc. NLP is the ability of software systems to recognize and interpret the meaning of human text and speech. 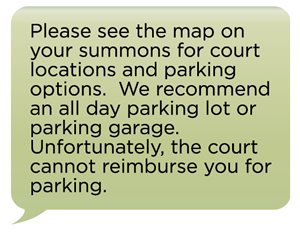 Information about how to access the mJuror system is included with the summons form sent to jurors. Jurors register by texting or emailing a 6-digit juror ID number to the mJuror address followed by a 5-digit electronic signature. Then, the potential juror is given details as to what day, time, and location for which the juror has been summoned. The potential juror is provided with a list of keywords available in addition to just communicating with natural language. Keywords include park, where, maps, when, security, attire, and help, which will provide the user important details, including what to wear and what not to bring with them into the courthouse. Because the user is on a smart phone device, the mJuror system can give exact directions and link to various maps on Google to allow for GPS navigation. The system is also intelligent enough to link to other websites for pertinent information such as weather, traffic conditions, or public transportation opportunities. For questions that have to be answered by a court employee, the application provides a phone number which the juror could call for assistance. The mJuror system provides assistance for the individual before showing up at the Courthouse. Allen County does not allow people to bring their cell phones into the building and potential jurors are notified of this prohibition in the summons. Within the first two weeks of using the mJuror application—and with no advertising of the system—the Court received 166 texts from 41 individuals out of the 500 summons that were sent. The Court anticipates that as the system becomes better known, the number of users will rapidly increase. The mJuror application is designed to be integrated fully with the Allen County existing interactive voice response and web based jury management system. Since 2002, the Allen Superior Court has used Judicial Systems, Inc., as its jury management software vendor. Because the Court collaborated on the final development and beta testing of the new jury module, the upgrade was installed at no cost to Allen County.